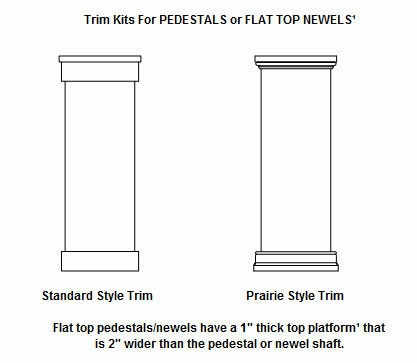 These pedestals were designed to be used with the Craftsman PVC column wraps, but they can also be used as newel posts or to wrap around or be used under other round or square columns. Typically the pedestal shaft is about the same width as the base of the upper column. As a general rule, the top platform of the pedestal should be wider than the base of the upper column. Most Craftsman products are cut to order on a CNC router. That means custom sizing on columns, panels, or trim is no problem. Like all our products, Craftsman Pedestals and Newels are available in wood on a custom order basis. We do not recommend wood craftsman columns or pedestals for exterior use. Our customers have been extremely happy with the look, feel and durability of Turncraft's Craftsman product line. Craftsman columns, pedestals and newels are non load bearing and ship flat packed for field assembly around a structural post. We believe there are many benefits to these non-structural column and pedestal wraps. Craftsman columns and pedestals are lighter, less expensive and cheaper to ship than load bearing columns. In addition, they are milled rather than molded, so details are crisper. Decorative load bearing columns require special care during the rough construction phase to prevent cosmetic damage. With a decorative wrap and pedestal you can install an inexpensive structural post, such as pressure treated or steel, during construction and then install your Craftsman wrap during the trim phase. For this 12x36 inch pedestal with recessed panels and Standard trim. 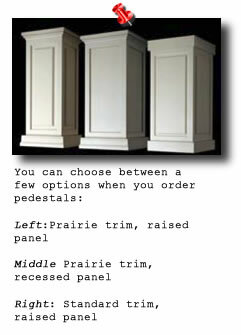 There are two trim kits available for these pedestals and newels. The standard trim kit is simpler and less expensive. The Prairie trim kit has a more detailed profile. The prices on this page are for pedestals and newels with a flat top. The top platform for pedestals is open and the newel top platform is a solid plate. A pyramid top for newels is available for an upcharge based on the width in the chart below. You can choose from three shaft styles for your pedestal: plain, raised or recessed panel shafts. The least expensive option is plain. This simpler style has neither raised nor recessed details.